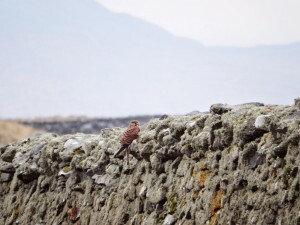 The colder conditions we’ve been experiencing across Scotland have led to an influx of golden plovers. 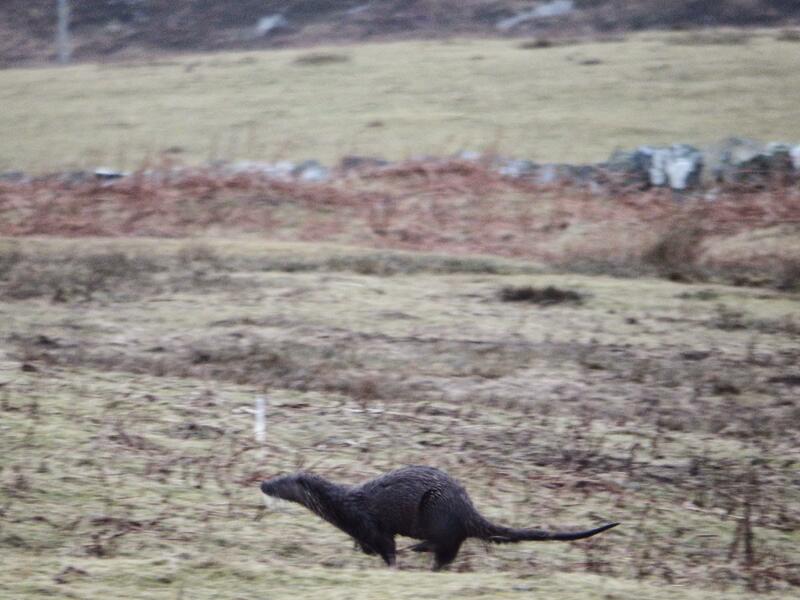 230 were counted on Oronsay this week. We suspect many will have come over from the mainland in search of food as the freezing conditions on the there will have made it more difficult for the birds to forage. 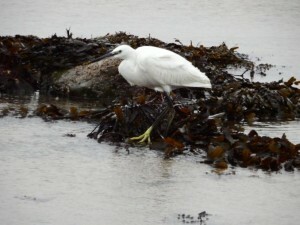 The little egret on The Strand has proved to enjoy the feeding there… it was still present well into January. Snow buntings have featured again on the island with a flock on four feeding on the spilt grain left over from feeding the cattle silage. A wonderful sight at this time of year. The strand lines on the beaches have also provided some very interesting finds. 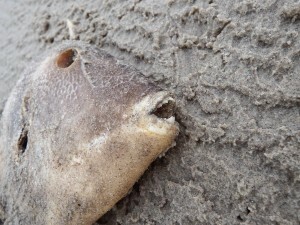 In December Mike and Val found a triggerfish washed up on the Long Loch. 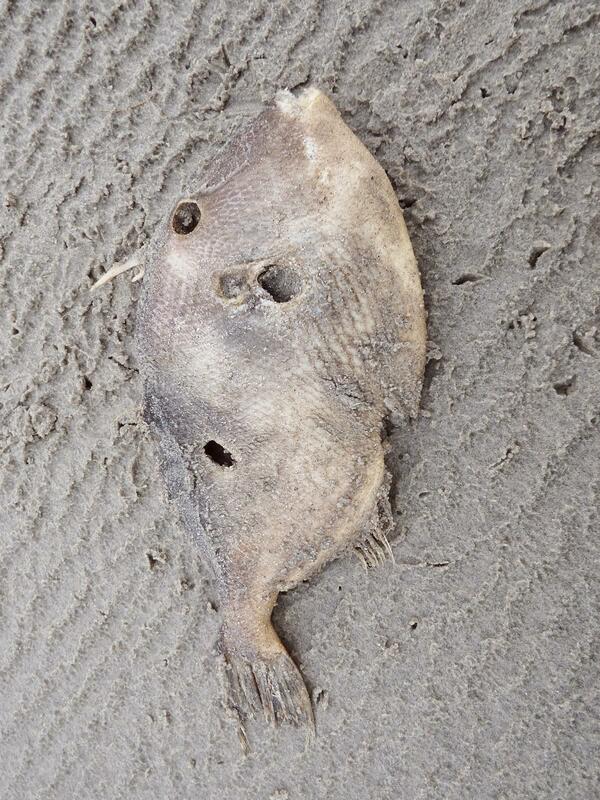 We’ve managed to identify the species as a grey triggerfish. This species of more commonly found on in the Western Atlantic and can be seen in shallow waters from Nova Scotia all the way down to Argentina. Populations of grey trigger fish can also be found in the Mediterranean and also off the West of Africa, which maybe where this specimen originated. This isn’t the first record of a triggerfish washing up on Oronsay but they are unusual to see. One of our colleagues on Tiree has also found a couple washed up after the storms. Another exciting find came in the form of a ‘sea-bean’. 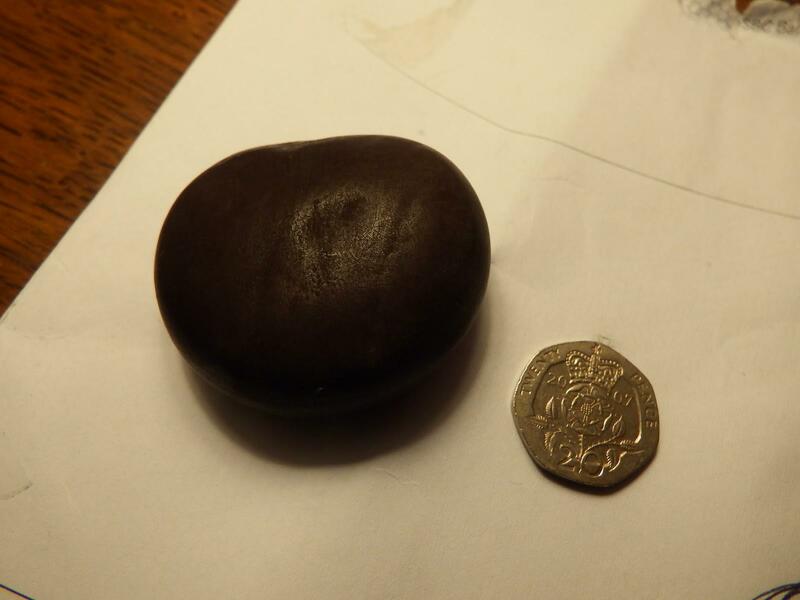 Whenever I walk the beaches on Oronsay, I keep my eye out for sea-beans. Also known as drift-seeds, sea-beans are seeds or fruits that have been carried out to sea after falling from trees or vines which grow along tropical shores. I love imagining where this one could have come across the ocean from. Somewhere a lot warmer that’s for sure. Jamaica perhaps? 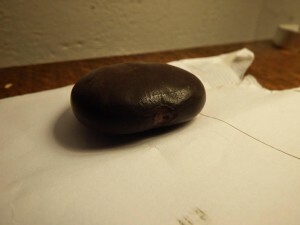 Sea-beans often float due to an internal air pocket within the seed. I am so pleased to finally find one! 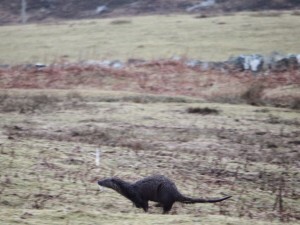 I had a fantastic view of an otter last weekend while out walking. 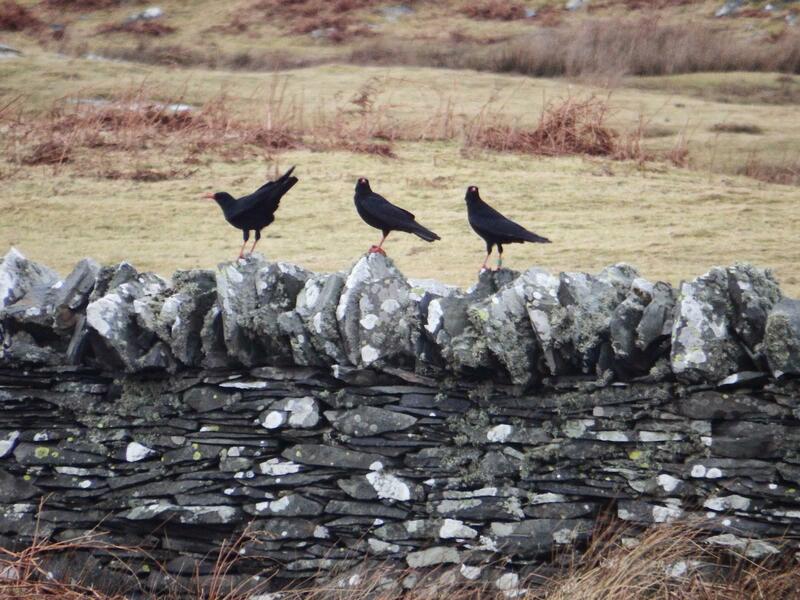 Three chough were busy mobbing it from one of the dry stone walls. It was a real treat to see one up so close. I managed to get a quick, albeit blurry, photo as it ran past – Trying to avoid the chough. We’ve had a flock of twenty chaffinch around the yard for much of the winter. They are often seen busy feeding around the silage bales for any spilt seeds. Reed buntings have also been around in small flocks of up to seventeen, also looking for an easy meal. The twite flock has also been roving around the fields in search of seed, we’ve had counts of forty individuals which is brilliant to see at this time of year. 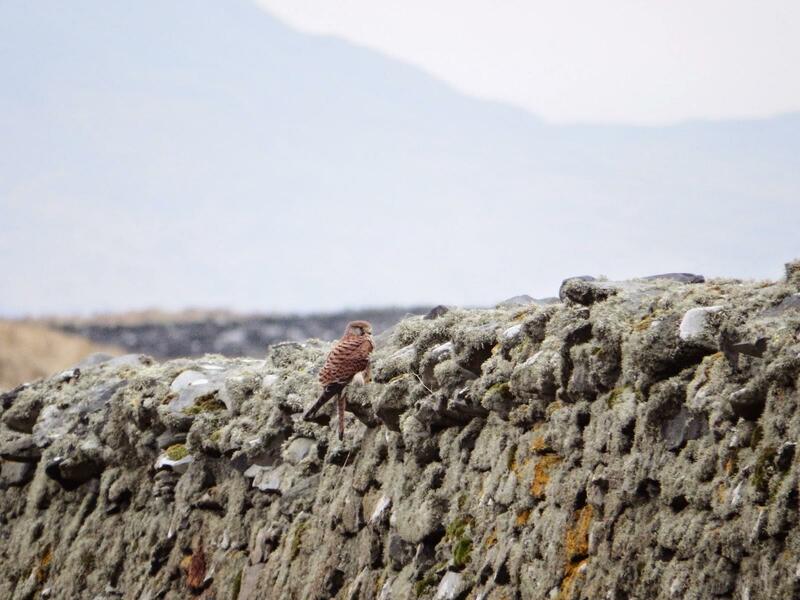 A kestrel has featured around the yard consistently over the last two months. It’s quite often on the wall by the farm house. 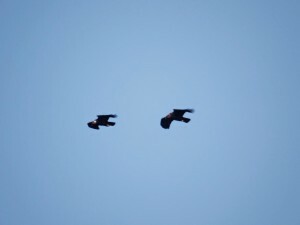 The hooded crows often give its position away by mobbing it as they fly past. Please do continue to keep your eyes peeled for any ringed herring gulls. 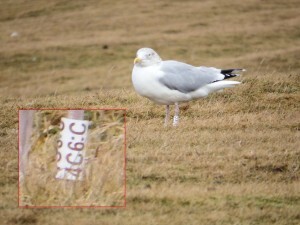 We’ve had three ringed gulls on Oronsay the last few weeks. The gull in the photo below was ringed on Oronsay last summer and was spotted in again here December. 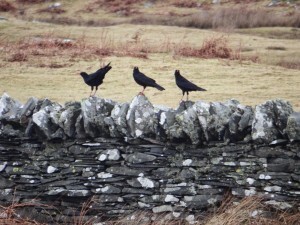 Especially with cold weather on the mainland an increase in wading birds such as lapwing and golden plover is highly likely so look out for flocks feeding in fields over the next month. Also to remember, if you have a bird feeder or table – Keep it topped up in this poor weather. This will really give the birds in your garden a boost!